A great threat looms over EVERGLADES NATIONAL largest mangrove area in the Mexican Pacific due to the interest of building the project: Canal Centenary and hydroelectric Las Cruces, in the state of Nayarit. Please spread this open letter to the President of the Mexican United States where we request the cancellation of the project. Organizations of civil society, local communities, fishermen and women, researchers and activists from twelve countries in Latin America, built at the International Redmanglar make an urgent call to cancel immediately final and revoke authorizations granted and construction of the Canal Centenary and hydroelectric Las Cruces, in the state of Nayarit. These projects threaten human populations that depend on important natural systems and threatens the integrity of the largest mangrove area in the Mexican Pacific as is the system of mangroves and wetlands of Everglades National. The diversion and damming of rivers that feed would generate serious impacts on the biodiversity of this area containing a quarter of Mexico's mangroves, affecting the Biosphere Reserve and a Wetland of International Importance Ramsar site EVERGLADES NATIONAL. National Wetlands are the heritage of all Mexicans citizens and world heritage due to its international ecological importance. You should know the serious problems facing humanitydue to climate change and its effects, so the conservation and protection of these ecosystems, it is becoming essential to ensure the medium and long term, Mexico will have natural buffers in good condition, to extreme weather events and thereby increase the capacity survival of the most vulnerable human populations. Supporting conservation EVERGLADES NATIONAL represents a clear message to local communities, for the same country and the international community that there is interest in protecting the rights of the population and to prioritize the common and collective good instead of special interests and business. We at the International Redmanglar wsh to make our call to you as President of the United Mexican States to respect the rights and demands of the people and wixárika náyeri, native peoples and sovereign over their territories, who reject the construction and imposition of these works that threaten the destruction their livelihoods, their lands and traditions and culture. We express also our greatest concern about the way in which these projects have been launched; an unclear and behind peoples back is undertaken in the region: disguising briefings consultation process, ignoring their territories, forms of organization and livelihoods, clearly violating the rights of indigenous peoples that the Mexican state has assumed constitutionally and internationally protected in Convention 169 of the International Labour Organization (ILO). Alarm that the opinion of the Environmental Impact Statement (EIS) issued by the Secretary of Environment and Natural Resources (SEMARNAT) authorize the works assuming that the environmental impacts are reversible and social impacts invisible, when the technical and scientific opinions SEMARNAT collected the same say otherwise. The arguments of the Federal Electricity Commission project developer, expressed to communities also demonstrate a lack of understanding of the environmental and social impacts that such projects entail. Express that "we must prevent the river water flowing into the sea waste" denotes ignorance of ecological processes in watersheds expressions fit within a single logic of misrepresentation and manipulation of information, we joined the rejection of these processes. Finally as civil society and the international movement We ask you in your capacity as President of the Mexican nation: Remove the political support for this project by severe impacts; canceled immediately and permanently revoked the authorizations granted and construction of the Canal Centenary and hydroelectric Las Cruces, in the state of Nayarit. Support and comply with the decisions and wishes of indigenous peoples to live harmoniously in its territory meets the voices as the Intercommunity Council for Sustainable Development Rio San Pedro, the Indigenous Council Nayeri and at least 20 fishing cooperatives, who have rejected the project by threatening their livelihood. so also express the International Redmanglar, together with our allies and members as Redmanglar Mexico, look forward to following this case. We endorse and support náyeri ancestral towns and wixárika, and generally to Mexican neighbors and fighting for the defense of their heritage. Brasil, Colombia, Cuba, Chile, Ecuador, El Salvador, Guatemala, Honduras, México, Nicaragua, Venezuela, Perú. Seven staff from China Mangrove Conservation Network (CMCN) and one representative from Shenzhen Spring Environmental Protection Volunteer Association (SENGO) visited Thailand 16th-25th August 2014 for a field study trip to learn about mangrove and coastal conservation efforts in Thailand. During this 10 days trip, the team, led by the founding director – Dr. Liu Yi, visited numbers of places in Thailand, including MAP-Asia Office and EMR sites in Trang Province, Leeled Community-based Tourism in Surat Thani Province, Kao Sam Roi Yod National Park in Prachuab Khirikan Province, the Sirindhorn International Environmental Park (SIEP) in Petchaburi Province, Amphawa District in Samut Songkram Province, IUCN Asia Regional Office (IUCN ARO) and UNEP Regional Office for Asia and the Pacific (UNEP/ROAP) in Bangkok, as well as Sea Turtle Conservation Center Royal Thai Navy in Chonburi Province. The members visited MAP – Asia office in Trang in the morning of 17th August to exchange their experiences about mangrove with MAP – Asia team, and to understand about the different aspects of MAP’s work, as well as threats to mangrove in Thailand. The CMCN group was welcomed by the MAP Asia Coordinator, Jim Enright who led the group in a lively and interesting exchange. In the afternoon, MAP staff Ms Piyapat Nakornchai, Global Nature Fund (GNF) Project Manager, took the group to Sikao District to explore a mangrove nursery and the 3 Community-based Ecological Mangrove Restoration (CBEMR) sites in the area. The CBEMR project is under the support of the Global Nature Fund, Ministry for Economic Cooperation and Development (BMZ), Foundation Ursula Merz and Synchronicity Earth. The team had great fun identifying various species of mangrove found in the area with many new ones present. The next day, on 18th August, the group travelled to Surat Thani Province to spend a night at the Leeled homestay. This Leeled Community-based Tourism (CBT) team had been involved in conservation for a long time, and integrated tourism to promote their conservation activities. After a mangrove boat ride, Thai cooking experience and an authentic firefly boat tour, the CMCN had a chance to ask various questions regarding CBT management from the operating team. They also visited a shrimp paste group and walked along the mangrove boardwalk nearby the next day. Later, the group headed to and arrived at Kao Sam Roi Yot National Park (KSRY NP) in Prachuab Khirikan Province in the evening. 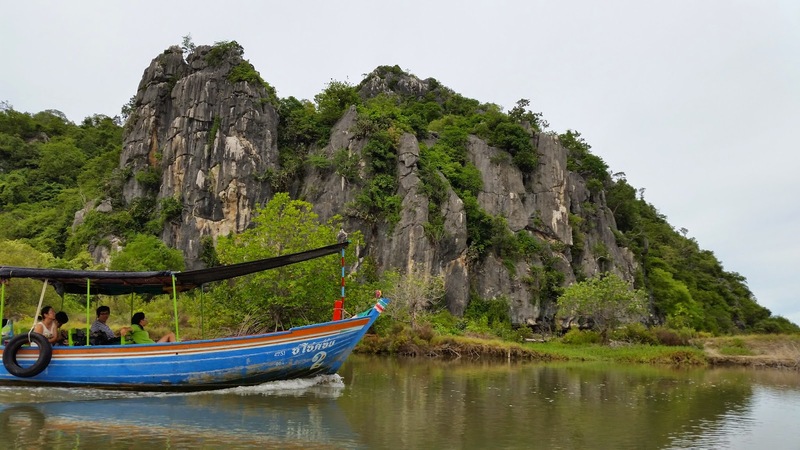 On 19th August, the team went on two boats to observe a fishing community near the national park, and landed on a bay to continue their hike to the famous attraction, Phraya Nakorn Cave. In the afternoon, they cruised along Klong Kao Daeng, (klong means canal) accompanied by an entertaining local guide. Hua Hin was the destination of the day. The following day, the CMCN members received an honor from Dr. Sonjai Havanond, the Deputy Director of SIEP, and Khun Areeporn Sittiyanpaiboon, the Head of Research and Development Group of SIEP, who welcomed the team and provided the information about SIEP’s mangrove conservation efforts, inspired by the Royal members. The CMCN group watched a video about SIEP and Royal Initiatives, walked the mangrove educational trail, and went through several environment- and energy-related exhibitions in the main SIEP building. After SIEP, the group headed to Amphawa District in order to experience another firefly tour, and spent a night there. On 22nd August the CMCN group travelled to Bangkok to visit the IUCN Asia Regional Office (IUCN ARO), as well as UNEP Regional Office for Asia and the Pacific (UNEP/ROAP). At the IUCN ARO, the group was welcomed by Dr. Scott Perkin – Head of Natural Resources Group, IUCN Asia and Dr. Robert Mather - Head, Southeast Asia Group, IUCN Asia. Then, they had a chance to learn about Mangrove for the Future (MFF) works from Mr. Raquib Amin – Project Manager of MFF Programme, and later Dr. Chamniern Vorratnchaiphan – Country Representative IUCN Thailand shared the stories of the works in Thailand. Afterward, Dr. Liu Yi shared the mangrove conservation work of CMCN to the IUCN Asia team. During this presentation by Dr. Yi, Ms. Aban Marker Kabraji – IUCN Asia Regional Director joined the IUCN team and showed interest in collaborating with the CMCN. This visit was made possible thanks to the coordination of Dr. Saroj Srisai – Programme Coordinator, Natural Resources Group, Asia. In the afternoon of the same day, the CMCN staff went to the UNEP/ROAP office to gain some knowledge about the UNEP’s works. They also shared their mangrove conservation work in China with the members from UNEP team, which include Mr. Jerker Tamelander – the Head of UNEP Coral Reef Unit, Ms. Angela Lentisco – Ecosystem Management Team, and Mr. Jinhua Zhang – Programme Officer, Science Policy Interface. The next day, the group departed Bangkok in the morning for Sattahip near Pattaya, where the Sea Turtle Conservation Center Royal Thai Navy locates. They learned about the sea turtle situation in Thailand, and expressed that products made from parts of sea turtles and other wild animals should not be bought by tourists. The following day, some of the crew enjoyed temples in Bangkok, whereas others went to other attractions. As an organizer of the trip, MAP hopes the team have gained valuable experiences and had a great time in Thailand. We also support the energetic team to keep up their great mangrove conservation work in China. 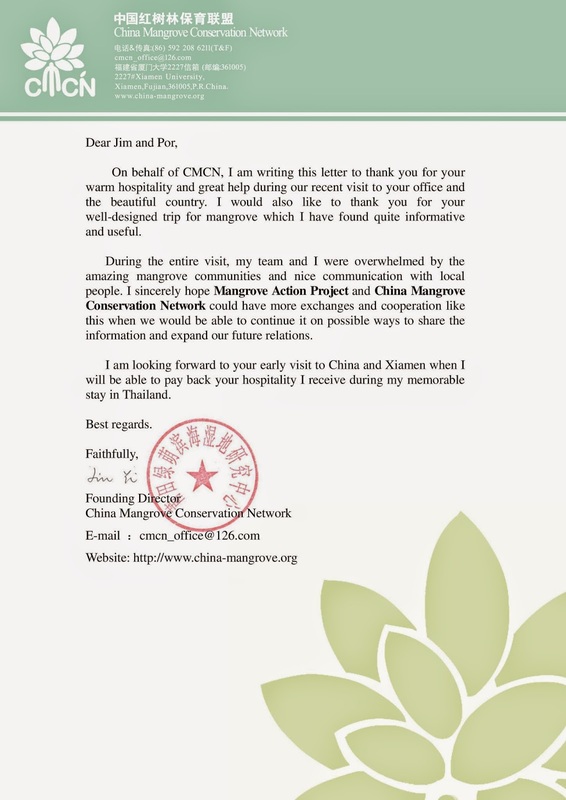 Note: MAP has been networking and sharing information with CMCN for over 10 years now and in 2013, Jim Enright of MAP-Asia Coordinator was invited as a guest speaker to a mangrove workshop organized by CMCN in Xiamen, Fujian. In 2012, Martin Keeley, MAP’s Education Director, introduced MAP's Marvelous Mangrove education curriculum to schools in Xiamen through CMCN facilitation coordination. Vote yes for mangrove conservation in Madagascar! Andy Hall could face 7 years in prison for doing something you and I do everyday -- talking about modern slavery. Editors Note: For months we have been following the environmental disaster that looms over the pristine island of Bimini. In this issue we feature several news stories that seem to indicate our voices are being heard, as the natural turning of the tide slowly erodes the movement to overdevelop the island. We must continue to press for conservation and protection of this last pearl. Editor’s note:The Lao dam will adversely affect area mangroves as well. Editor’s Note: The importance of mangroves as a carbon sink as a buffer against climate change continues to be a growing interest. Mangrove, seagrass and tidal marsh ecosystems sequester up to five times more carbon than tropical rainforests, say marine scientists who are calling for their protection . . . another good reason to protect and restore mangroves. Mangrove Forests Key to Carbon Sequestration and Blue Carbon. We at Mangrove Action Project have long contended that so-called "natural disasters" are better called "unnatural disasters" because of the human caused damages to the protective mangrove buffers that have tragically increased the damages and death toll from natural events that would otherwise have been mitigated by the mangroves' living bio-shield. For information, please visit MAP's website. A group of individual tourism activists and representatives of civil society groups from six continents, gathered in Istanbul from 28 to 30 August 2014 to discuss human rights, social justice and sustainability concerns in tourism. The outcome of the meeting was the foundation of the Tourism Advocacy and Action Forum as a first step to rebuild an international network and forum for courageous dialogue on tourism impacts and to develop a proactive global tourism advocacy and action platform. Please find TAAF’s Istanbul Statement below. If you endorse the Statement and you are interested in receiving regular information from TAAF, please email the TAAF Secretariat, c/o Equations, at info(at)equitabletourism.org and/or tim-team at timteam02(at)yahoo.com. Calling All Storymakers! Learn. Create. Win! Sustainable Development Solutions Network (SDSN) has prepared a statement to world leaders on the serious risks posed by climate change. By clicking here you can add your name. Editor’s Note: the following story demonstrates the importance of continuing education about the benefits that mangroves provide to mankind, and highlights the ease at which environmental issues become political. Thank you very much on your Kind e.mail. it is very nice to get your kind information. Still we are friendly with our hearts. We are dedicated to MANGROVES. Very recently, due to our influence, All of Sri Lanka mangroves have declared as conservation Forest in Sri Lanka by Minister of Environment of Sri Lanka. This was one of our great victory on conservation of MANGROVES. Please visit at any time. We are not deviated from MAP. MAP is living in our hearts.